I like the late 90s idea that devotees of Ayn Rand might prove to be unusually resistant to the false religion of the Antichrist, because of how sweetly naive it is. Rand built up a formidable cult of personality around herself that is probably only limited by intentional eschewing of religious elements. Thank God. I have some inkling of this, because I too felt the siren call of Rand's individualist philosophy as a teenager. The scholarship programs aimed at high school students that encourage them to read The Fountainhead or Atlas Shrugged are persuasive genius. Intelligent high school students are the perfect targets for this kind of thing. Some small percentage are probably hooked forever. As a teenager, I read everything I could find by and about Rand. And then I discovered how weird she really was. The best story [recounted by Greg Cochran in his recent interview] is how her adulterous lover Nathaniel Branden decided to end the affair they had been carrying on and marry a normal woman. In response, Rand required all remaining members of her inner circle [including future Federal Reserve chairman Alan Greenspan] to denounce Branden, and forsake all future association with him. That incident, above all else, helped me see how batty it all was. I also fondly remember my parents, sweetly pooh-poohing this bosh. Which is just as well. I think the Objectivists are about as likely to end the world as anyone. One of the rules of supernatural fiction seems to be that the devil gets the best lines but the Antichrist sounds like an unpersuasive used-car salesman. 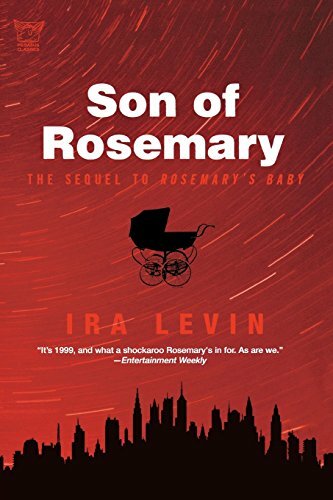 This pattern holds in "Son of Rosemary," Ira Levin's long-delayed sequel to his well-known 1967 novel, "Rosemary's Baby." ("Son of Rosemary" is dedicated to Mia Farrow, who starred in the film version of the earlier book) Mr. Levin at least has an excuse. He is perhaps best known as the author of the play "Deathtrap," the longest-running thriller in Broadway history, so it is not surprising that "Son of Rosemary" is really a murder mystery that runs on the dialogue. (The title of this review is taken from a tabloid headline in the story.) Though of course there is some action and other descriptive writing to illuminate the situation, still most of the burden of arousing our suspicions falls on the Antichrist himself. As much as his mother loves him, she thinks he sounds just too good to be true. The only problem with this technique is that an intimate family drama is not really the appropriate setting for a murder mystery whose victim is the entire human race. As doubtless the whole world knows, "Rosemary's Baby" dealt with the birth of the Antichrist in a noted New York City apartment house that bore a more than passing resemblance to the Dakota. This building darkly and famously overlooks Central Park in Manhattan, and its reputation has grown still darker since the assassination of resident John Lennon in its lobby in 1980. In the sequel, we learn that Rosemary Reilly divorced her loathsome husband Guy, who had sold her body to the building's coven for insemination by Satan. The coven put her into a coma when the resulting child was six years old and she was secretly planning to flee with him. (The fact she stayed in the building six years is another illustration of how hard it is to find a decent apartment in the city.) Rosemary comes out of the coma 27 years later, just as the last member of the coven, a retired dentist, is run over by a taxi. She then goes about discovering what her little demon-eyed tike has been up to in the interim. By 1999, of course, Andy is 33 years old, the same as Jesus at the time of the crucifixion. The difference is that, unlike Jesus at that age, he is the most popular man in the world. It is hard to say why this is the case, exactly. He goes around negotiating international peace agreements and encouraging people to be nice to each other, apparently to some effect, but he lives the life of the sort of media mogul whose natural environment is Manhattan Island south of 90th Street. Still, for whatever reason, most of the people in the world wear lapel buttons that say "I Love Andy" ("Love" is represented by a heart-shaped symbol). Soon they start wearing "I Love Rosemary" buttons, too. He does not ask much of his admirers. All that he requests is that everyone in the world light a candle at midnight, Greenwich Mean Time, on New Year's Eve, 1999. Exactly at 12:00 a.m. A harmless gesture. Surely. When Rosemary comes out of coma, she is not-unreasonably dubbed "Rip Van Rosie" by the media. The interesting thing, though, is how little explanation the 1990s seem to require. Aside from personal computers and the end of the Cold War, there is not much that is really new. (One cannot help but reflect that, had this novel been written 10 or 15 years ago, it would have dealt at length with how much New York had worsened.) Certainly Rosemary's politics seem well-preserved from the late 1960s. Andy the Antichrist is in cahoots with certain easily recognizable conservative Republicans and members of the Religious Right ("Rob Patterson," for one), who want him to endorse a slightly goofy millionaire publisher for president in the presidential race of 2000. (Ah, if only they knew!) Even more remarkable than the Antichrist's friends are his enemies, who seem to consist mostly of the followers of Ayn Rand. Known generically as "P.A. "s (Paranoid Atheists), they are the only people in the world who do not buy Andy's talkshow piety. The main problem they pose, however, is not that they threaten his personality cult, but that they might not light their candles with everyone else. "Rosemary's Baby," or at any rate its popular success, is often cited as evidence for an anti-natalist streak in popular culture that is supposed to have appeared at about the time of its publication. Certainly in the United States those were the years when the Baby Boom ended, so it is not unreasonable to suggest that people might have been more open to a story that did not view the birth of a baby as an unalloyed blessed event. (Levin's 1976 novel, "The Boys from Brazil," was a high-tech version of the same theme.) Be this as it may, there are certainly none of the conventional anti-natalist motifs in "Son of Rosemary." There is no huffing and puffing about overpopulation, for one thing, though that theme is hardly unknown in eschatological fiction. There is no occasion to mention kids as a career drag, and certainly there are none of the gruesome descriptions of morning sickness that figured so prominently in "Rosemary's Baby." Of course, the whole human race is exterminated, so you could say the book illustrates the effect of a really strict population control program, but somehow I don't think that is the point. Something else that is not the point is universal eschatology. Although the Antichrist (and of course the Anti-Mary) are the central characters, "Son of Rosemary" really has nothing to do with late 20th century beliefs about the Last Days, or for that matter the endtime beliefs of any time or place that I am aware of. In both this novel and the earlier one, we are dealing not with apocalyptic, but with the world of ritual magic. Though this sort of thing does have its demotic side, the Levin books follow the literary tradition that places it among the educated and well-to-do. Its ceremonies must fit into private apartments (however high-ceilinged), and its conspiracies are little vendettas. You cannot profitably fit an apocalypse onto a stage so small. We see the world end on television and in that spectacular view of the Park. Still, "Son of Rosemary" is a genial book, considering the subject, and it will please people who remember the earlier novel when it was new. My memory played tricks with me as I read "Son of Rosemary." At first, I did not recall having read "Rosemary's Baby" at all; I thought that I remembered the story just from the movie. Gradually, though, I realized that I recalled information that could not have been on film, so I probably did read it while I was in grammar school. The little details are lovingly recalled in the new book. The tannis root. The scrabble. And then, of course, there is the wicked anagram, ROAST MULES. One word. No, I won't tell you.